Search for a specific Raging Pencils comic and/or Rant. Why am I not drawing a cartoon about the Ford/Kavanaugh hearing? Because we all know she'll tell the truth and that Kavanaugh will lie, and then the Republicans will either vote for Kavanaugh or ask him to withdraw. It's all up to what level of evil cowardice the Senate Republicans will ascend. Here's hoping for the best. And thank you Dr. Ford. You're a true hero. This is a good time to remind everyone that Brett Kavanaugh has ruled that polygraphs can be accepted as gospel by employers in making hiring decisions. If my best friend had been falsely charged of sexual assault, something to which I was an active witness, wild horses couldn't stop me from testifying on his behalf. Brett Kavanaugh's best friend in high school, Mark Judge, is hiding at a friend's house in Delaware and refuses to testify. Grassley, Hatch, Graham, Cornyn, Cruz, and Lee. They're all on the Senate Judiciary Committee deciding whether Brett "Roofie" Kavanaugh should be a Supreme Court Judge. In a sane world Dr. Ford's complaint could have been quietly forwarded from Sen. Feinstein to the FBI, who could have quietly investigated and then quietly forwarded the findings to the Senate Judiciary Committee, who could have then decided, in a non-partisan fashion, if the allegations were serious. Brett Kavanaugh is a judge. If the Republicans on the Senate Judiciary Committee had walked into his court with the same evidence they're now trying to lynch Ms. Ford with Kavanaugh would have thrown them out of his court for wasting everyone's time. And, yet, there he sits. Smugly waiting while the world burns. This is not a judge, this is an opportunist. I was listening to the giant Orange Man-Baby's press conference yesterday and thought "Would just ONE reporter ask Trump if he's out of his goddamn mind?" After awhile it was clear that no one had to. Texas set a new voter registration record, with 1.6 new million voters since the mid-terms of 2014, and 400,000 new voters since March. That's not a good sign for Republicans. I am the Red Hen. I am Maxine Waters. I am Patricia Okoumou. I am Kristin Mink. I am Robert De Niro. I am David Hogg. I am Emma Gonzelez. I am Mike Avenetti. I am Stormy Daniels. I am Rachel Maddow. I am Pickaxe Guy. I am LeBron James. I am Robert Mueller. I am Alexandria Ocasio-Cortez. I am Peter Strzok. I am Elizabeth Warren. I am Heather Heyer. I am Beto O'Rourke. I am Andrew Gillum. I am Senator Sheldon Whitehouse. I am Botham Jean. I am Plaid Shirt Guy. I am Ronan Farrow. I am Christine Blasey Ford. I am Julie Swetnick. I am Deborah Ramirez. Raging Pencils t-shirt from the RP Spreadshirt store. 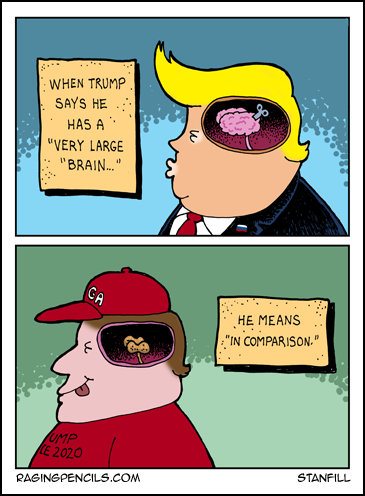 When Trump says he has a very large brain he means in compariosn to his voters.